What was wrong with the old center? For years and years, I’ve been a loyal visitor to Stonehenge. The ancient monument sits proudly alongside the A303 and every time I go past it I want to go and visit it. I first went there as a child, aged about 4 or 5 probably. I remember at the time being allowed to walk amongst the stones and actually climbing and sitting on them whilst the guide droned on about where we were. I must have had some kind of moment there back in 1970, as I have always loved going to see the site. Today, I drove along the A303 and sat in traffic jam after jam. I’d had enough, so took a familiar detour to go along the ‘other’ road (B3083 to Shrewton, and then turn right along the A360) that meets up at the same roundabout, but passes the Stonehenge visitor centre. Imagine my surprise when I found the road ahead closed, and a strange new building on the landscape, approximately two miles from the monument itself. Instead of the familiar and always friendly visitor experience, I was greeted by a very modern and slightly disturbing piece of architecture, and no sign of a tunnel under the road to scamper along in eager anticipation. Oh no, those days are now a relic, just like the monument. On arriving, and after paying a fiver to park (you do get it refunded), you go to a large and fairly open covered space. To your right are a very dominating set of three toilets. To your left, a cafe. Behind the toilets is an exhibition, and behind the cafe is a souvenir shop. Between the two is a set of kiosks to buy your tickets. I already hated it. Regardless, the ticket buying is slick, the exhibition very techy… but I am sad to say not a patch on the underground time tunnel of before. It doesn’t come close to raising the excitement of it’s older version, and everything is on display in museum type cases. Modern, brightly lit, and not at all what it was – that’s great, some might say – that’s progress! Out of the exhibition you can see a mock neolithic village, complete with fibre glass sarson stone on a wooden frame. it looked fake, it is fake and it doesn’t help. Up until then I am going with the new feel, but then the very worst thing happens. You get on a bus to go and visit the stones. The new visitor centre is about 2 miles from the stones. You can walk it, if you’re energetic enough, and can go past barrows and other antiquities. Lovely. But a bus is a must for anyone who is older, infirm, too young, lazy, wants a bit of help… in fact, nearly everyone. And sitting on a bus for two miles to get to the monument is nowhere as exciting as a time tunnel and rushing through it to get to the stones! This is not the way to build up anticipation and excite the youngsters – or indeed the old ‘uns! It is a sure fire way to build an anti-climax. This, English heritage have done in spades. So much of an anti-climax that I couldn’t wait to leave. So I go on the bus to trek the two miles back and was ushered, I kid you not, into the shop. Filled with the usual ‘henge based goods, it did nothing for me. I went for a bite to eat instead. The cafe feels new, clean, modern – excellent, I thought. 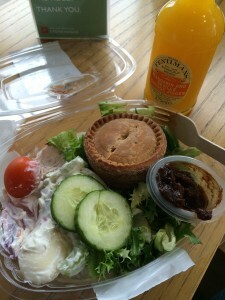 I found a pork pie and salad box for £4.75 – a bit high, but it looked tasty. At the till I learned that despite the ‘offer to buy’ on the shelf, the price to pay was a hefty £6.75 instead. I protested, but to no avail. I decided to pay up, and eat. And when I did I just about gave up – the food is a disgrace. The pie was filled with a tasteless mush not at all resembling pork chunks – more like mechanically recovered meat from the inside of a sausage.. revolting texture, and all encased in the most abysmal and salty pastry I’ve ever had the misfortune to taste. Two salad potatoes, two slices of cucumber, a cherry tomato, some ‘slaw and about a tonne of lettuce – mostly iceberg, nothing close to tasty. Tasteless, badly priced and served with no more than a wooden fork that would be at home at a seaside chip shop. It cost me a fiver to park, £17.50 to get in and (with a drink) £9 to eat – except I didn’t – I left it. I toyed with the idea of joining English Heritage today. And then decided not to. This is NOT the experience I want each time I go to Stonehenge – a conveyor belt of tourists, not one ounce of excitement and everything geared towards getting people in and out fast. A two mile bus ride… it’s a nonsense. A pastiche of what was there, and as far as I can see, there’s no reason why the centre could not have been a *lot* closer to the monument. Now, if English Heritage also run their other 400 sites throughout the country in the same way I want no part of it at all. I’ll not join an organisation so clearly disjointed from the user experience and so appallingly and obviously driven to a quick buck. This is NOT what English Heritage used to be about, and not what I want it to be now. So I’ll keep my cash and buy membership to the National Trust instead. And what is even more sad, I’ll never visit Stonehenge like that again. I’d implore you all to protest if, like me, you have gone to it since the 70s or before, and now found your visit there to be something very removed from what it was. OK – so the stones are in the same geographic location, but everything that was special about them has been moved. Or ‘re-moved’… you decide.